The Bureau of Labor Statistics released the Regional and State Employment and Unemployment report for April today, which mirrors a disappointing jobs report at the national level for April. The decline of unemployment rates across most of the country has been decelerating, with fewer states seeing their unemployment rates drop—much like how the national unemployment rate has stalled at 5.0 percent. In April 2016, the U.S. economy added just 160,000 jobs, the smallest gain since September 2015. California and Florida made up over three-fifths of those jobs gained in April. 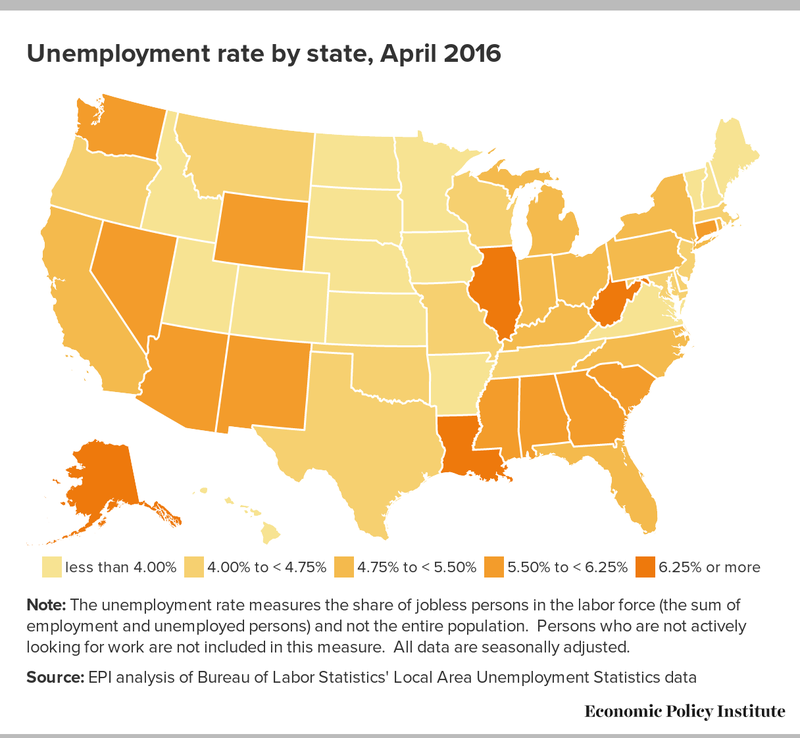 From January 2016 to April 2016, 27 states and the District of Columbia experienced declines in their unemployment rates, while 18 states had their unemployment rates rise. The states with the largest declines in their unemployment rates were Tennessee (-1.1 percentage points), Oregon (-0.6 percentage points), and Mississippi (-0.7 percentage points). States with the largest increases in their unemployment rates were Wyoming (+0.8 percentage points), Pennsylvania (+0.7 percentage points), and Indiana (+0.6 percentage points). Five states experienced no change. From January 2016 to April 2016, 42 states and the District of Columbia added jobs. The largest gains occurred in Utah (+1.1 percent), followed by Massachusetts, Missouri, Washington (all +1.0 percent), and Georgia (+0.9 percent). 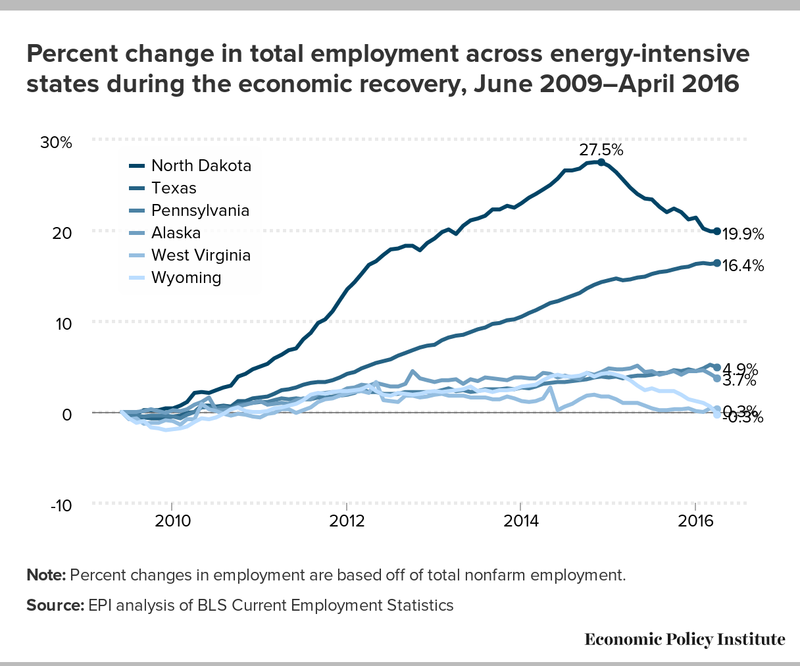 Of the seven states that lost jobs, the hardest hit states continue to be energy dependent states like Wyoming (-1.5 percent), North Dakota (-1.3 percent), and Alaska (-0.7 percent). The last year and a half has been difficult for states where energy industries make up a significant portion of their economies. North Dakota is unique among this group of states though, because much of the state’s energy production was recently developed in the wake of discoveries of shale gas reserves there and recent years’ economic growth has seemingly been uniquely driven by the energy sector. 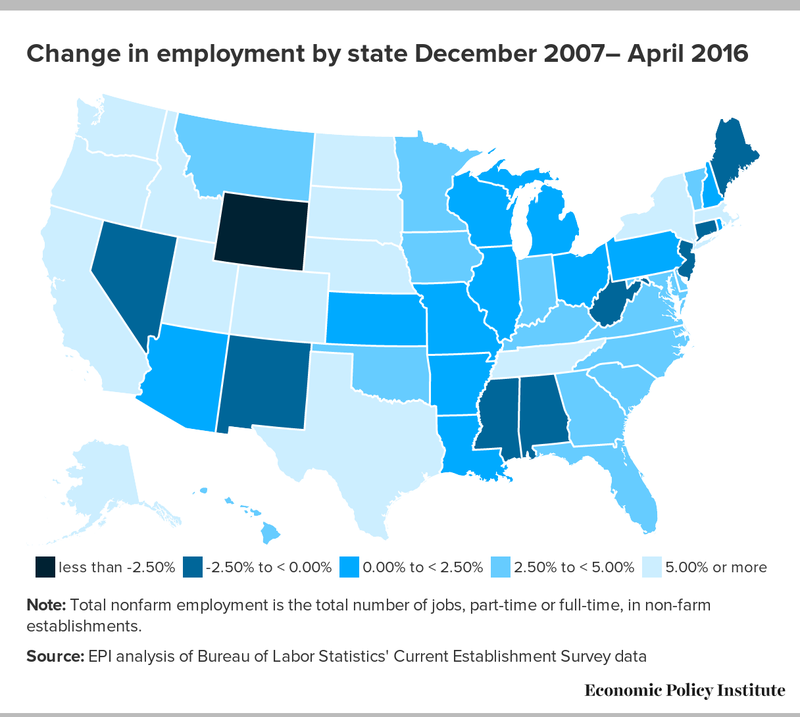 As a result, the state saw a dramatic rise in employment, by more than 27 percent from 2010 to 2015 (as seen in Figure C). As energy prices fell North Dakota’s employment has correspondingly declined substantially, by 6 percent between January 2015 and April 2016. Other energy states already had preexisting energy production and did not see the dramatic rise that North Dakota experienced in recent years. Some of those states, like Texas and Pennsylvania, have also diversified their economies enough to withstand the blow from suffering energy industries. What this ultimately means is that although all energy states will continue to hurt from low energy prices, North Dakota is likely to endure a far steeper decline in their economy and employment because such a large share of its employment boom was due to the nascent energy industry there. This volatility can leave long-lasting scars, as infrastructure built to accommodate this industry’s sudden ascent could be just as easily abandoned. Note: Percent changes in employment are based off of total nonfarm employment. The overall underwhelming jobs report in April again reinforces the fact that we are far from a full recovery and the Fed should therefore hold off on raising interest rates. Across almost every relevant indicator of productivity and labor compensation, growth has returned to a sluggish rate while concerns about preventing asset bubbles also fail to justify any rate increase. Meanwhile, the Obama administration has been taking important steps to restore labor standards such as the right to overtime protections as well as combat abusive non-compete agreements, steps that are integral to boosting workers’ pay and protecting their work-life balance.